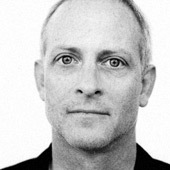 Between 1985 and 1997, I was partners with Stephen Doyle and Tom Kluepfel at Drenttel Doyle Partners in New York City. While Tom stayed home to mind the shop, Stephen and I did endless road trips, making presentations, mostly for the AIGA, in cities across the country. Often we'd be asked to design our own posters for these events. 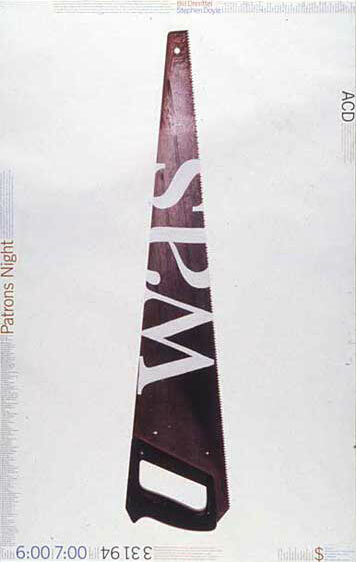 I came to work one day in 1994 and Stephen was masking out the word WAS onto the face of a lumber saw. He said watch this: and he painted the masked area white. This was my first experience with Stephen's word art, a dyslexic's nightmare, the simplest of words translated into a three-dimensional graphic form. The Was Saw. Or the Saw Was. Is it graphic design? Or a tool for murder? Stephen Doyle is a graphic wordsmith. 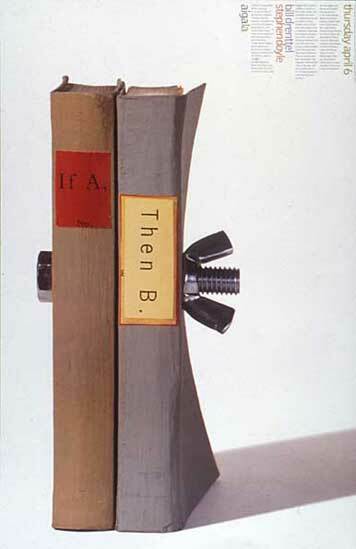 Stephen did another poster in 1995 for AIGA Los Angeles where he bolted two books together, and added a bit of Wittgenstein across the spines, "If A, then B." Two partners bolted together in partnership? Craft and strategy? Design and commerce? I still have the actual object, the two books bolted together, as one of the favorite objects in my library. After my departure, Doyle Partners continued to play with word forms across many projects, and it's hard not to open The New York Times and immediately recognize a piece of graphic artwork as the work of Stephen Doyle. It's usually just a word, or a word transformed into another word. Usually it's photographic, a real object redone — and not a trompe-oeil in Photoshop. There is something about contemporary culture where words become separate from their meaning, or acquire so many meanings as to become meaningless. The weekly presentations for the William Safire "On Language" column in The New York Times are an example of language being turned into editorial art: language is the assignment. In this Op-Ed World, words alone are evocative. They do not need commentary as their graphic form is its own commentary. There are other practitioners of this art — Chip Kidd, Michael Bierut, Paula Scher, to name a few — but Stephen Doyle has always seemed to me to be the most obsessed with making individual words meaningful, even transcendent, in a graphic form. If Op-Ed art is the new public form, Stephen has a calling; he is the master of the word made meaningful. In recent years, Stephen has begun to make sculptures of words, passages from Machiavelli, entire literary works by Willa Cather. Here, a graphic designer explores how far the making of words can migrate into other forms. I've never read The Professor's House, but I know Stephen Doyle's reading is different from mine, from the book in my library. To me, this kind of word-tinkering a lot like working through a geometric proof. You show the reader the logic path through words - word meanings - ironic juxtaposition and a beautiful compositional path to conclude at a fablous proof/truth. I was at the presentation. Clearly this was a tool for murder. I really liked the saw. It took me a while to find one where the cutting edge went right into/under the handle. Brilliant! I've always been a fan of the work, and am so pleased to see new pieces here. Thanks, Bill. I have to confess being as much a fan of his "thing" (see last week's incredible NYTimes Cigarette Morgue-pack and earlier, the BP oil / logo spill. Excellent, meticulous executions. I think Doyle shares a similar method with Sagmeister and others; in showing process they engage viewers in a crafty how to/ what if game. Collaborative, inspired stuff. The golden Pentagoose picka pecked some painted words and crossed the crowded street... could you stand to gander this gander? I'll bet yes. Pity, I can't seem to get the paper animation to play on my browser. Although, I'd love to see it when it functions. I love your blog. I find it to be one of the most esteemed and informative forms of current design dialogue on the net right now, and I have been a reader for years. What I don't love is how self-referential the folks at DO have become. Surely you could have named more appropriate designers and illustrators when speaking about the editorial word/art style than Michael Bierut and Paula Scher; names I see way too often here. Time to think outside the box? @brad: you see Michael Beirut mentioned a lot because, he is the founder of DO and writes here a lot. Wow, this stuff is just amazing. Thanks for posting the slides. Love the wordplay. Man of Words: A Portrait of Steven Heller and The Discourses, Machiavelli are both equally brilliant. I have to wonder how long it must take him to do just a single project. Very inspirational work. Thanks for bringing this to our attention William. Great, just great. Having never seen this work before, I am blown away. To me, this is the epitome of excellence in design. We should all strive for the same level in our own work. I'm cool with only spending my few leisure moments looking at thought-provoking, sophisticated, stimulating, meaningful, beautiful work  and the critical writing about it. This is why I visit D.O. Can we all agree that there's no value in wasting our time discussing anything created by Elliot Peter Earls and plan to never see any posts like that one? Stephen Doyle has long been one of my favorite designer-artists currently at work. Thanks for collecting some of his pieces in this post. I also love his concrete books, which are not featured in this piece (because they lack words?). Like much of his other work, the concrete books rearrange my notions of an object I thought I knew and understood. Turns out there are many ways to behold the book, the word, the sentence, the phrase. Stephen's work reminds me of this. Wittgenstein tells us that the limit of our language is the limit of our world. I want to live in a world that celebrates work like Doyle's.